As one of the world’s most respected guitarists in one of rock’s most commercially successful bands, John Frusciante seemingly had it all figured out. So when the famed alternative guitar guru opted out of his second stint as a member of the Red Hot Chili Peppers in 2009, many racked their brains for an explanation. 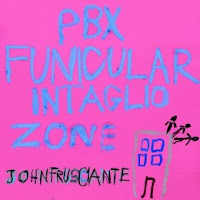 But listening to PBX Funicular Intaglio Zone, it’s clear that Frusciante had an itch that the Peppers couldn’t scratch. A record as sprawling, layered, and flat-out bizarre as its title would suggest, reveling instead in an eclectic mix of electronica, funk, free jazz, and krautrock. The record’s break from the Peppers’ funk rock formula shouldn’t come as a complete surprise to those familiar with Frusciante’s past solo efforts, which have always been hard to categorize. Some, like 2004′s Ian MacKaye-produced DC EP, keep things on a straight and narrow pop rock path, while others, like 2001′s To Record Only Water For Ten Days, are more enigmatic. But even with that caveat, PBX is Frusciante’s most challenging and niche effort to date. “Bike”, with its Buddy Rich-on-crank drum intro and skittering Pro Tools backbeat, sounds like a sonic freak-out from the year 2036, whereas “Ratisug” works its way back toward center while preserving the record’s heavy electronic lean. The LP is anything but even-keeled, and the music constantly changes course, often within the same song. But with repeated listens, that quickly becomes part of its zonked-out charm. PBX is a record strung out on big, sometimes half-baked ideas and lots of lofty ambition, and fortunately Frusciante has accrued enough good will for listeners to let him off the leash some. It hits (it’s hard to listen to the beginning of “Mistakes” without thinking of that A-Ha video from 1987) and it misses (“Uprane?” Good God, what’s happening? ), but still it keeps the air underneath its wings. If Frusciante had to bail on his Peppers gig to find inspiration, at least the result tickles the eardrums in some unexpected ways.